Today, Thorsten Heins delivered the first of what may be several defining moments for Research in Motion throughout 2012. The core BlackBerry brand and platform, which helped define smartphones a decade ago, is losing major market share to newer operating systems like Android and iOS. Three months ago, RIM ousted its co-CEOs, promoted Thorsten to the top spot, and has been silently doubling down on its current strategy to have its own platform running on its own devices (read about all that drama here). The move is risky, and today we got our first real look at the next generation of RIM products: BlackBerry 10. The new smartphone OS, which is built on the same software that powers the BlackBerry PlayBook could be a sink or swim moment for RIM when it launches later this year. It has seen numerous delays, but Heins insists that it is now coming along nicely. All these statistics are pleasant, but presentations from Salesforce and Citrix drag things on. 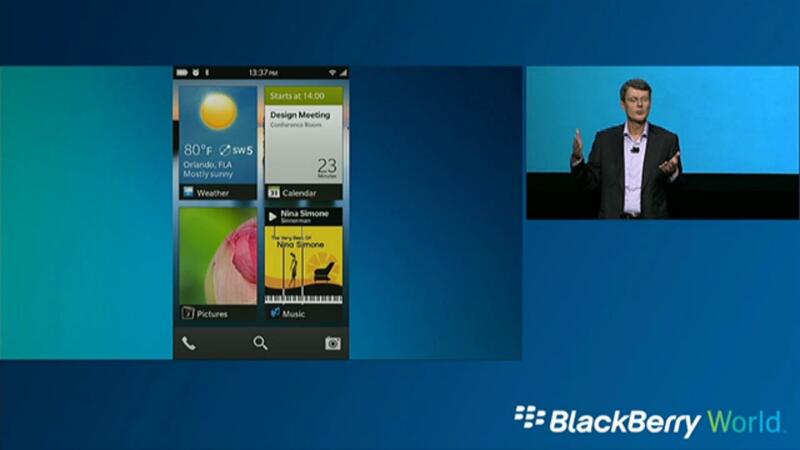 Luckily, BlackBerry 10 is actually shown off. 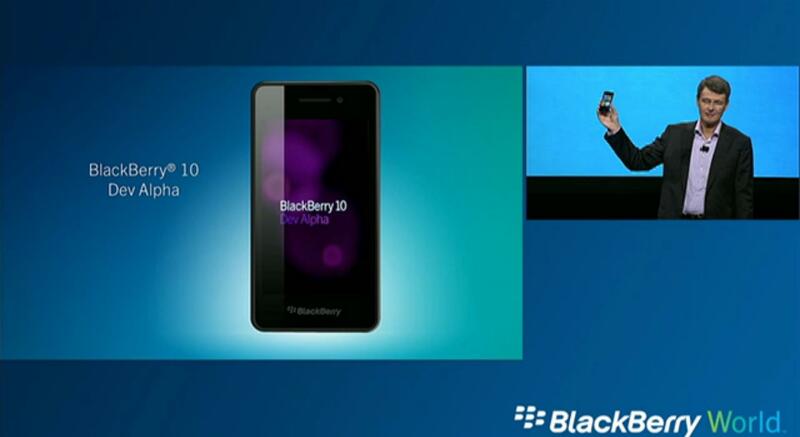 The device you see here is called the BlackBerry 10 Dev Alpha device. It’s not final, but all the developers in the audience at BlackBerry World will get one to take home. From its outward appearance, it looks nearly identical to a BlackBerry PlayBook tablet in almost every way. It is a completely touch device and has a 4.2-inch screen and front facing camera as well. “We’re taking our time to do this right,” said Heins. 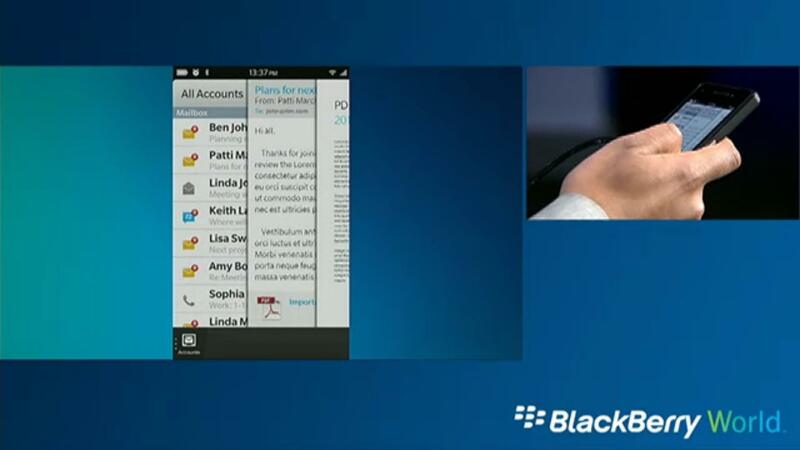 Other than the 4×4 grid of widget/shortcuts reminiscent of Windows Phone (in a way) that you can see at the top of this post, Heins and head of software portfolio at RIM, Vivek Bhardwaj, showed off BlackBerry 10’s ability to “flow.” Basically, no matter what app you’re using, you can hold your finger down and slide it to the right to take a peak at the last couple apps you were using. They said this new feature allows you to more easily move from task to task and check what you were just doing. We’ll have to test it to fully realize the benefits of a feature like this, but it does look pretty nice. 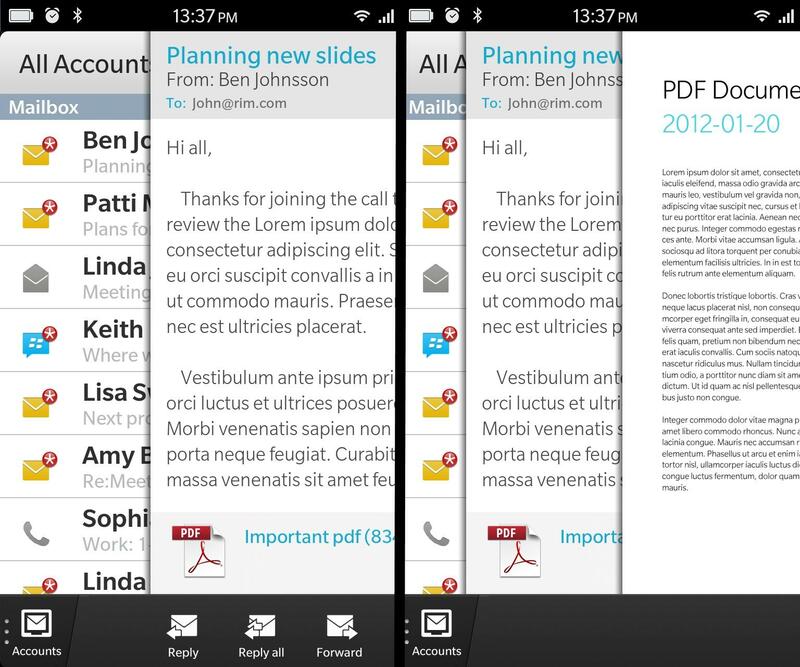 This feature is possible because BB 10, like the PlayBook, keeps all of your background apps running in real time. Other platforms like Android and iOS have a system of freezing apps when they are not in use, allowing them to be held in status and resumed later. This technique has been preferable since it doesn’t use many resources. The PlayBook, from our testing, only seems to hold things in real time, which is great, but it means that only 5-10 apps can be running at a time. Once you have opened too many, the OS will automatically shut down your oldest app, even if you were writing a critical email. Hopefully RIM is adding in some application freezing as well. 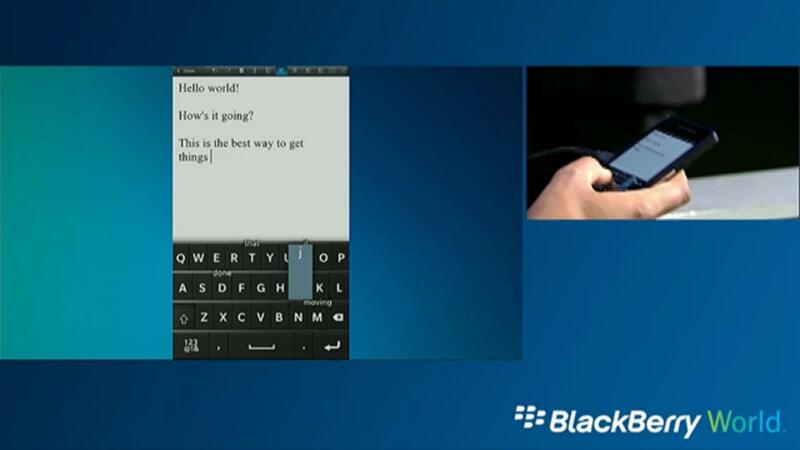 While Heins defended BlackBerry’s classic keyboard vehemently, he also showed off the new BlackBerry 10 keyboard, which is completely touch-based. It’s certainly not a looker, but supposedly this new keyboard customizes itself to your use. We’re not sure on how exactly it is customizable, but Heins and Bhardwaj said that it can be adapted. You can swipe down to change the keyboard in some ways as well. While you’re typing, words will appear on the keys, similarly to how the PlayBook recommends words to you. If you want to delete what you’ve typed, you can hit the backspace key or swipe to the left on the keyboard to instantly delete the entire last word (nice feature). This photo is from Engadget, as I failed to grab a good shot of this feature. Heins showed off new camera software that appears to let you retroactively zoom in on someone’s face in a picture and rewind it, allowing you to fix things like closed eyes or a bad smile. Fantastic idea, but it wasn’t actually shown on stage, so it’s hard to say how well it really works. Every presentation needs its “One more thing” moment these days, and Heins decided that unveiling a BB car onstage would generate some excitement. 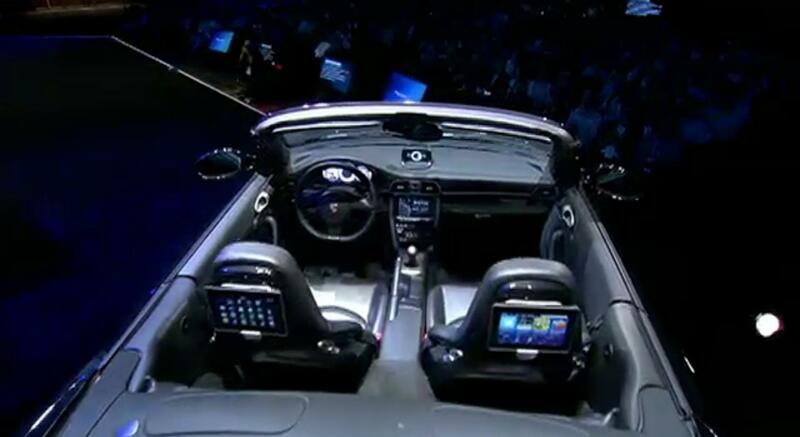 This concept car integrates PlayBooks in the back seats and uses BlackBerry 10 in the dash. Though it sounds new, this concept is anything but. QNX, which is an OS RIM bought and turned into BlackBerry 10 (and PlayBook Tablet OS), has been used in cars for years. Sixty percent of cars, according to Heins, already have QNX-based dashboards. If RIM can get all of the car makers to replace QNX with BlackBerry 10, now that will be exciting. No such partnerships were announced today. 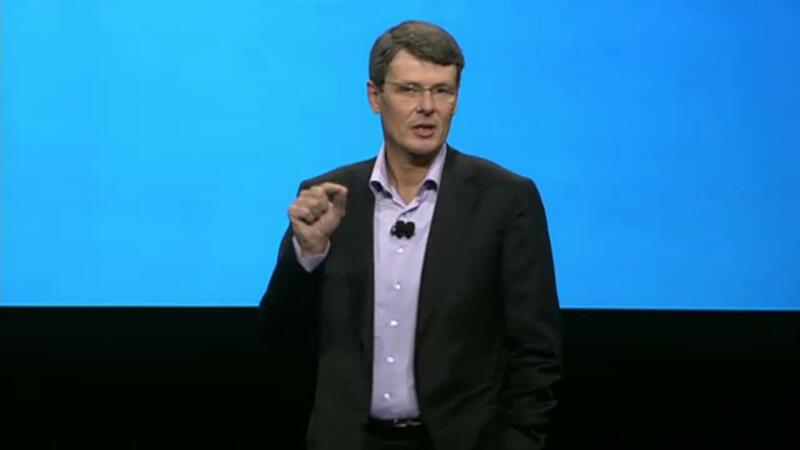 Heins says the car is just one new area where BlackBerry can go. This teaser was shown at the end of the show. It doesn’t show much (not even a phone), but check it out. 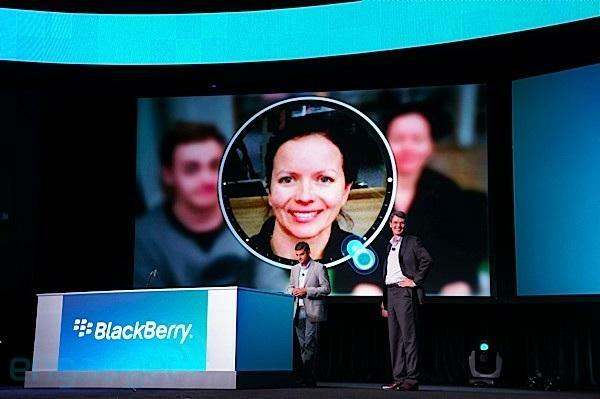 For developers in our audience, you can find the BlackBerry 10 dev kit here. It was released right after the presentation. We have to admit, while the hardware and visuals certainly weren’t anything flashy, it is nice to see RIM unveiling some original software ideas. The ultimate success of BlackBerry 10 later this year will depend on a lot of factors, but as a first glimpse, I’d have to say that today was a success. For the first time in a while, we are thinking about the future of RIM. Before today, it was hard to imagine much of a future at all. What do you think? Does RIM stand a chance? Update: Added some better screenshots.